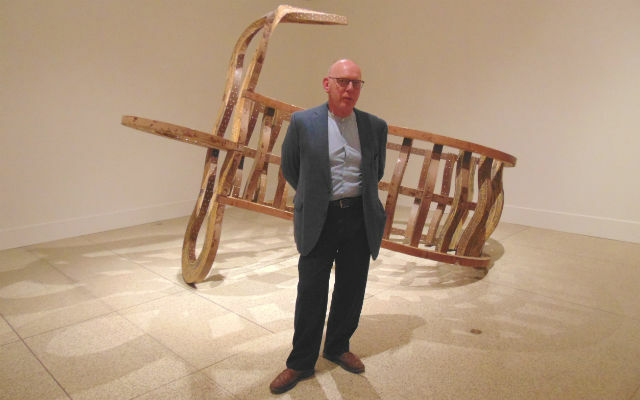 The San Diego Museum of Art‘s largest exhibit of contemporary art in a decade opens Saturday with a retrospective of the work of acclaimed British sculptor Richard Deacon. Deacon, a winner of Britain’s prestigious Turner Prize, was in the San Diego for the opening, and spoke to museum patrons at a reception Thursday night. 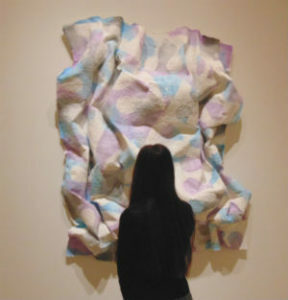 A patron examines one of Richard Deacon’s creations. “You’re lucky you have a museum of this quality here,” he said to widespread applause. The exhibition “Richard Deacon: What You See Is What You Get” examines his use of different materials and techniques to create free-standing sculptures, wall-mounted art, glazed ceramics and works on paper. He describes himself as a “fabricator” rather than sculptor. Some 40 works covering more than three decades are on display. The exhibition begins with a talk by Deacon at 11 a.m. Saturday and runs though July 25 at the museum in Balboa Park.